China has developed a spherical robot with retractable telescopic arms according to extremely thin news sources. Although the news sources don't say very much, I was able to find what is apparently the patent for the device, which has plenty of details. A spherical walking robot includes: a spherical coronal; a spherical housing which has a surface groove and is opposite to the spherical coronal; a walking and transmission mechanism in the spherical housing; a lift and transmission mechanism connected with the spherical coronal and the spherical housing respectively, and the spherical coronal is operative to move close to the spherical housing to close up the spherical walking robot and is operative to move away from the spherical housing; mechanical arms located in the surface groove, and the mechanical arm includes a little arm and an upper arm connected with the little arm by an elbow joint motor, the upper arm is immovably fixed on the spherical coronal, and when the spherical coronal departs from the spherical housing, one end of little arm away from the elbow joint motor rotates around the elbow joint motor and the little arm extends out of the spherical housing. A spherical walking robot includes: a spherical coronal; a spherical housing which has a surface groove and is opposite to the spherical coronal; a walking and transmission mechanism in the spherical housing; a fastness mechanism connected with the spherical coronal and the spherical housing respectively, and the fastness mechanism makes the spherical coronal away from the spherical housing, and forms a gap between the spherical coronal and the spherical housing; a rotating mechanism rotatably connected with the fastness mechanism, and configured in the surface groove of the spherical housing; mechanical arms located in the surface groove, and the mechanical arm includes a little arm and an upper arm connected with the little arm by an elbow joint motor, the upper arm is immovably fixed on the rotating mechanism and driven by the rotating mechanism, and one end of little arm away from the elbow joint motor rotates around the elbow joint motor and the little arm extends out of the spherical housing. As seen from the above technical schemes, by fixing retractable arms on the spherical walking robot, the spherical walking robot can move around agilely when it retracts its mechanical arms, and can be used as a mechanical hand or a mechanical foot or other sensors when it extends out its mechanical arms, so that many specific operations can be performed by the spherical walking robot. In this way, the spherical walking robot according to the embodiment of the present invention has a moving characteristic and an operational characteristic, and extends the application scope of the traditional robot greatly. 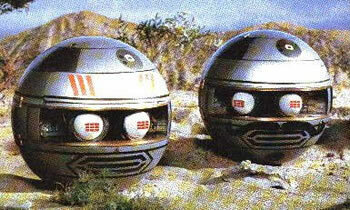 SF fans may recall the early 1980's series The Terrahawks, which had spherical robots called Zeroids were used to fight the evil witch-like alien Zelda. Nanny was built in the shape of a sphere, a large metal sphere, flattened on the bottom. Her surface had been sprayed with a dull green enamel, which had become chipped and gouged through wear... On each side of the hull was the outline of a door. From these the magnetic grapples came, when they were needed. And don't forget the Robot Spy, from the 1960's series Jonny Quest (thanks, Winchell). You don't suppose that this is really a project created in an old monastery by Dr. Zin? See the robot reveal its retractable arms around 1:40 - and watch out for those retractable antennae! Via Spherical Walking Robot and thanks to our friends at Frolix_8 for reminding me about Nanny.